We are proud to announce the creation of Opera Access for New Canadians, a community outreach and engagement initiative to make the COC’s BMO Financial Group Student Dress Rehearsals and select performances accessible to new Canadian citizens and newcomers to Canada, including immigrants and refugees. The first phase of Opera Access for New Canadians begins this spring with the COC joining the Institute for Canadian Citizenship’s Cultural Access Pass (CAP) program, which offers new Canadian citizens one year of complimentary admission to more than 1,200 cultural attractions across the country. The ICC will work with the COC to allocate and distribute dress rehearsal tickets to its CAP membership. A maximum of 40 free tickets will be set aside to every COC dress rehearsal as part of the opera company’s enrollment in the ICC’s CAP program. In addition to attending a dress rehearsal, participants will sit-in on one of the COC’s BMO Financial Group Pre-Performance Opera Chats and receive an informal tour of the COC’s opera house, the Four Seasons Centre for the Performing Arts. The first COC productions to be accessed through the opera company’s involvement in CAP will be Carmen and Maometto II, in performance at the Four Seasons Centre in April and May 2016. New citizens who have received their Canadian citizenship within the past year can register for a Cultural Access Pass. The pass is valid for one year from the date of obtaining citizenship. For more information and eligibility requirements, visit www.icc-icc.ca, e-mail [email protected] or call 1-888-359-6998. The creation of Opera Access for New Canadians is the formal implementation of a COC initiative first mentioned by COC General Director Alexander Neef from the stage of the Four Seasons Centre (mobile version here) on opening night of the company’s presentation of The Marriage of Figaro in February 2016. The COC subsequently hosted small groups of Syrian and Ethiopian refugees at performances of The Marriage of Figaro, facilitated by the ICC, Lifeline Syria and The Ripple Refugee Project. 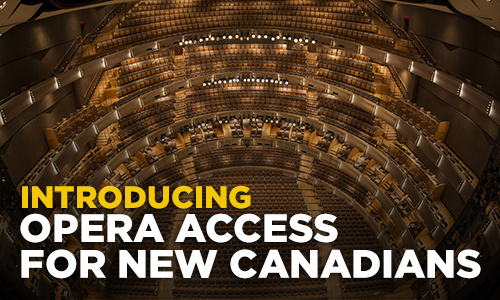 As Opera Access for New Canadians develops, additional partnerships will be announced that allow for increased accessibility to opera dress rehearsals and select performances for newcomers to Canada, including immigrants and refugees. The ICC was founded in 2006 by the Rt. Hon. Adrienne Clarkson and John Ralston Saul to welcome new Canadian citizens and foster active citizenship for all Canadians. For more information, visit icc-icc.ca.